Just like that, President Obama finds himself in the midst of one of the most challenging periods of his presidency — and it could get a lot worse. At home, the White House faces an ongoing debate over how to fund the government, how much to cut and which side — Democrats or Republicans — are going to blink first on the looming issue of entitlement reform. Both parties on Friday seemed to come to an agreement on a three-week continuing resolution that would keep the government open while cutting about $6 billion. It would continue to fund the government when the current stop-gap bill expires on March 18. The Three-Tailed Giant Turtle (三尾の巨大亀, Sanbi no Kyodaigame) is a large, turtle-like tailed beast. It was formerly sealed in Yagura. The Three-Tails receives much more attention in the anime than the manga. At some point in the past, the Three-Tails was sealed within Yagura from Kirigakure. It was later extracted from its host for some reason and escaped into the wild. Because it did not have a host it was not smart enough to effectively utilize its great strength, instead being reduced to animal instincts. So I get a call to do a live interview on a Japanese radio program, ZIP FM from Tokyo. Hello World! I taught mathematics and computer science in Chiyoda Cho, Yamagata Gun, Hiroshima, Japan at Lehman-Hiroshima College. I enjoyed my time in Japan. At the end of the interview I annouced the next song, which was of course, Three is the Magic Number by Blind Melon. Many thanks to ZIP FMm Tokyo, Japan! AIZEN-MYOO: Japanese Buddhist deity of lust suppresion. Will turn your desires towards enlightenment. Looks rather angry, has three eyes and a lion in his hair. 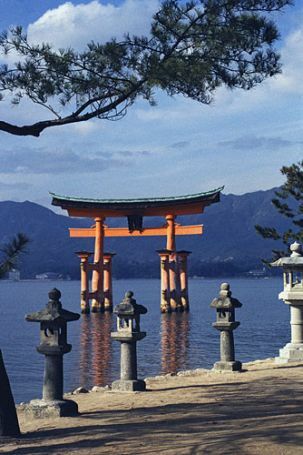 Located several miles off the coast of Hiroshima city, the holy island of Miyajima is a sacred site of both Shintoism and Buddhism, and one of the most enchantingly beautiful places on Earth. Japan. Kazan Retto, island group, c.11 sq mi (30 sq km), W Pacific. The group consists of three islands, of which Iwo Jima is the most important. The highest peak (3,181 ft/970 m) is on Minami-iwo-jima. This section includes three videos and three songs of Three is the Magic Number. This includes songs and videos by School House Rock, Blind Melon and De La Soul. We also include a featured article by the late Professor Alan Dundees on the number three in American culture. This section concludes with an interview with Zip FM, Tokyo, Japan by Michael S Eck, author of The Book of Threes.